Non-exclusive contracts means that the client does not have exclusive access to our work. Under exclusive contracts, we work only for you and your financial institution, for the duration of the contract. Exclusive contracts are a good way to lock out your competitors from the advantage our analyses confer. A sample of Technical Analysis commentary in the TA-sections. Click it to view it in full-size. Trend Direction estimates. Knowing the current trend direction is important for proper risk management and trade management. Estimated Predictability. The financial markets vary in structural predictability. 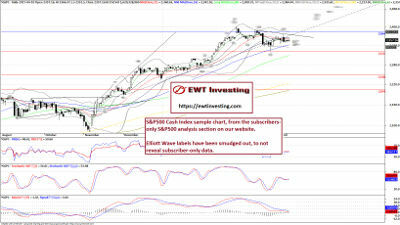 EWT Investing is the first Elliott Wave analysis service to take this into account. Risk/Reward Estimates. These are based on our experience as successful traders, and are a rough estimate of how successful and/or safe a trade in a certain direction seems to be. Important Levels. If there are any relevant buy/sell signal levels or structurally decisive levels that are likely to result in a specific market movement, they are included in the Risk/Reward comments. 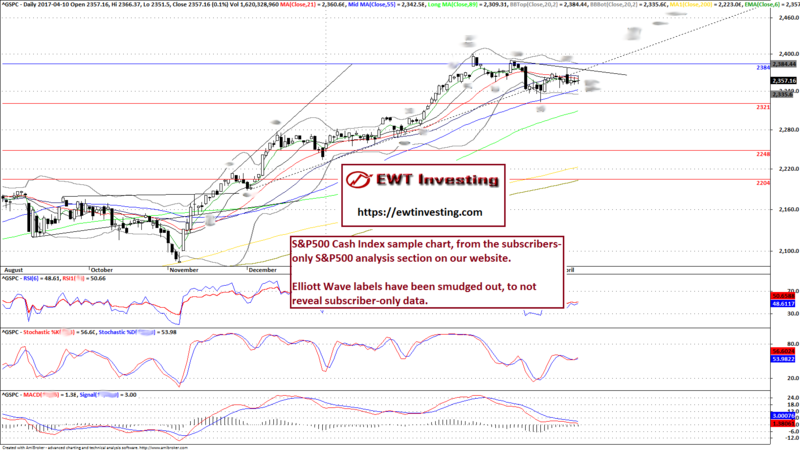 Technical Analysis & Extended Elliott Wave Theory Commentary. We offer concise and descriptive TA & Extended EWT texts, describing what we think the markets will do next. Most analysis services offer lengthy comments spanning several pages, but that's the hallmark of neophyte amateurs who can't distill their knowledge into short and easily digestable commentary. A sample of a technical analysis charts that go with written analysis. Click the chart to view a full-size version. Technical Indicators. Our TA charts include commonly used and useful indicators such as BBands, RSI, Stochastic and MACD. Moving Averages. A selection of important DMA's that generally have value as trend indicators and moving support/resistance levels are included on the charts. Critical Levels. Important critical & trigger levels are drawn. Extended Elliott Wave Theory labels. Extended Elliott Wave Theory labels are of course included in the charts. Q: Do you bill automatically after my initial subscription ends? A: Automatic billing is activated by you at the time of billing. Q: Where are my analyses? A: All the analyses (text+charts) are published on this website and are accessible to you by clicking the "Analyses" link in the top menu, and then selecting the market you want to read about. The GEWC subscription gives you access to all the 22 financial markets listed above - all in one package. Q: Do you use computer software for your Elliott Wave analyses? A: Yes - in the sense that we use eSignal and Amibroker charting applications to do our analysis work. No - in the sense that we do not use any software automated Elliott Wave markup. Extended Elliott Wave Theory analysis cannot be succcessfully automated and handled by computer programs, because attempts at automated pattern recognition are arbitraged out by the vast amount of algorithmic/automated traders. Q: I read one of your analyses, and now I wonder what the market will do? A: The market will do whatever it wants to. There are no guarantees that it will move according to our analyses. All trading and investing activites - no matter how well-founded and well-thought out - are a game of chance, ultimately. However, the analyses on this website are written by successful traders. The analysis process we use works for us most of the time and it delivers conclusions which we use for our own trading activities. That doesn't necessarily mean it will work for you in the same way. There are no guarantees - but hopefully you'll find our analysis work useful for your own analysis and trading. Q: Why are you not mentioning suggested financial instruments to trade, nor entry/exit points, nor position size? A: Our GEWC Trades strongly outperform the market. However, we do not recommend specific instruments for the GEWC Trades. The reader must always make up his/her own mind as to exactly how he/she wants to trade any given market or stock we've analyzed or otherwise commented on. Q: To which markets or stocks is the Elliott Wave Principle applicable? A: The Elliott Wave Principle can be applied to any widely traded financial market index, commodity or even single stock (though with somewhat less reliability) with a high enough number of participants. The Elliott Wave Principle can also be applied to forex, but requires a slightly different analytical perspective than for stock market indices. Q: What time-frame should I use in my trading? A: That's completely up to you. However, the GEWC Trades are usually intended to be at least 5 or more trading days in duration. Q: How often are the analyses updated? A: Each respective financial market is updated as indicated in the Package boxes above. If a particular market hasn't moved in a way that invalidates our previous analysis or requires new commentary, the written analysis might not be updated until the next time we go over it - but the TA-charts are always updated regardless. 1. Frequently our analysis work accurately predicts market behaviour for some time into the future. 2. Financial markets are sometimes stuck in corrective phases which do not require a lot of updates - nor offer enough clues for a new conclusion to be attained. 3. Sometimes, a couple of hours of analysis work are required on just one financial market, in order to derive accurate Extended Elliott Wave models. Our energy is best spent on dealing with the difficult markets, rather than writing an analysis update which only reiterates the contents of a previous still valid update.